The Peach Jam never fails to produce a storyline. The tournament is grassroots basketball's greatest proving grounds, and each year, someone capitalizes on their opportunity to prove themselves against the nation's best. This year was no different. Tons of players stepped up for their respective teams. But one statement can be said with an extremely high-level of confidence. None one took off Iverson Molinar. 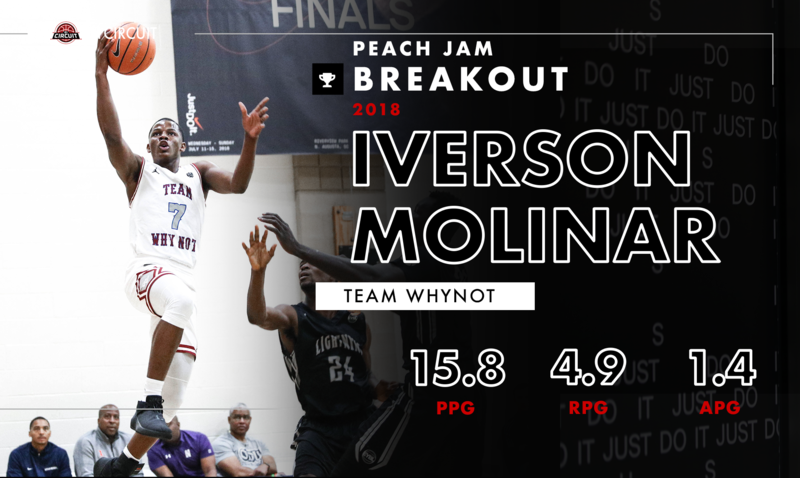 Team WhyNot's 6-foot-4 combo guard was sensational over eight Peach Jam games, improving his regular season averages across the board while helping the Los Angeles-based squad to the Peach Jam Championship game in their inaugural season. Molinar shot a blistering 63.3 percent from the floor, almost never taking an ill-advised shot over an eight-game span. Molinar - named after NBA superstar Allen Iverson - was lights out from the perimeter, drilling 47.4 percent of his three-pointers behind a beautifully-crafted jumpshot. The Panama native averaged 15.8 points per game - second to Cassius Stanley on Team WhyNot - including a 25-point, 5-rebound performance in a semifinal win over the defending Peach Jam champion Oakland Soldiers. Molinar averaged 4.9 rebounds and 1.5 assists on top of his scoring production, and was an effective cog in WhyNot's defense. He can guard multiple positions, and implements a competitive, no-nonsense playing style. Molinar's efforts paid off immediately, evidenced by his scholarship offers from VCU and Georgia. Expect more offers to roll in for the talented junior as he stars this high school season for Covenant Christian in Georgia.